Taylor is “framing” the Church. And that’s a good thing. After Steve Taylor gave the first-ever public screening of his movie The Second Chance to a small audience at the Biola Media Conference last weekend, he took questions, praise, and criticism from the crowd. I was there, and I’m so glad I was. I wish I could go into detail, but I need to be fair–the film isn’t finished, and Taylor asked the press not to review it. So a review will have to wait until the final product is released. But I will say that if you’re worried about having Michael W. Smith in the lead role (and I was … Could he act? ), you can relax. He’s well-suited to the role he’s been given. Even better, Jeff Obafemi Carr shines in his role as an inner-city church minister. 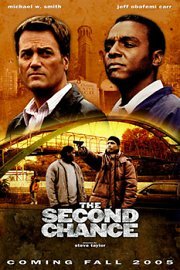 “The Second Chance” stars Michael W. Smith and jeff obafemi carr. The most interesting aspect of the film’s release will be this: How will Christians respond to it? You and I both know how well the church handles criticism. But one of the highest functions of art is to hold up a mirror and let us see our own reflection. If that reflection is dismaying, so be it. Taylor’s been holding up mirrors to Christian culture since I Want to Be a Clone, and he’s still serving us in that way, although he’s traded in his satirical switchblade for a fuller, bolder, and ultimately more compassionate approach. i was blessed to be a restraunt guide(after steves concert both his band and rez band wanted to go out to eat and i hopped on thier tour bus and led them to the nearest i hop( IT WAS THE BEST I COULD AT 2AM)ANYWAY since that time i have alway;s been a fan . I can’t wait to see GRIZZLY MAN. Sounds like it’s got everything I love in a documentary. I liked PENGUINS all right, but still think WINGED MIGRATION is a more glorious and moving docu on a similar subject. but still think WINGED MIGRATION is a more glorious and moving docu on a similar subject. I liked Winged Migration until I saw the behind-the-scenes stuff on the DVD, which then made it all seem like nothing more than elaborate goose-wrangling. Granted, there are some nice shots, but knowing how staged it all was took a lot of the magic out of it for me. Yeah, I know what you mean. Still, I like to think the birds were doing what they would have naturally done, and the wrangling made it possible for me to see it. Then again, I very well may be deluded. j. roberts parks is in chicago? winged migration, i’m venturing, would have been much better on (and exclusively on) the big screen. Jeffrey: Sorry it’s taken me so long to comment on this post, but I wanted to tell you how much I enjoyed the way you brought these three films together. I’ve seen only one of them, but you’ve given me solid context for the other two. Very nicely done! Thanks, but this piece was written by J. Robert Parks. I’ll pass along the praise to him. Man, do I feel dumb. Sorry ’bout that. Thanks for clarifying.